Created as part of the crowd-funded 10 Scents' Worth project. There are 11 reviews of The Dark Heart of Old Havana. 4160 Tuesdays The Dark Heart of Old Havana is a curious mix, one that certainly sounds appetizing its note listing, but not one of Sarah's best executions, at least to my nose, as far as sweet fragrances go. Fruits, sugar, tobacco, vanilla, pepper, tonka, jasmine, and musk should, in principle, create a very sweet, perhaps slightly spicy tobacco scent, but I tend to agree with many reviewers that it's in the fruit mix, particularly during the opening, that I get a bit lost. In fairness, the dry down is much more pleasant, the fruits more in harmony with tobacco and vanilla/sugar/tonka trio, but the opening is challenging to the point of being prohibitive, at least for me. Sadly, probably the worst offering I've tried to date from 4160 Tuesdays, but that's only because I've loved and bought so many of Sarah's offerings that the bar is set very high. 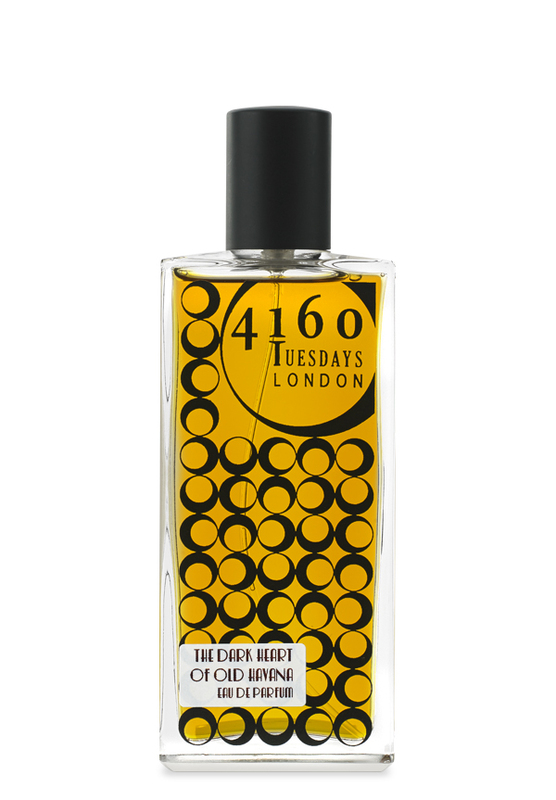 The Dark Heart Of Old Havana is my third fragrance by 4160 Tuesdays, after The Lion Cupboard and Tart's Knicker Drawer. I'm wearing it for the second time today, and, strangely, it seems a different fragrance altogether from my first wearing, two days ago. The first time I wore this fragrance, I found the sour fruit notes completely overpowered most of the other notes, and could smell little else, apart faint vanilla and tobacco notes. Today, this is a different fragrance altogether (I wore Rive Gauche yesterday, so The Dark Heart Of Old Havana might seem sweeter in comparison): I'm not smelling the fruit notes at all; instead, this fragrance started off as powdery pepper notes, and slowly sweetened, and developed vanilla, tonka and tobacco notes. Now, after wearing it for about 4.5 hours, coffee notes have appeared. The fragrance reminds me of a more subtle, and far more natural version of A*Men Pure Coffee. Initially I thought this fragrance wore very close to me, but so many people have noticed it today, it clearly has strong sillage. Not overpoweringly heavy, this makes a lovely autumn and winter fragrance. Never been to Havana but I doubt heart (dark or otherwise) of anything smells like this. Starts with gag inducing peachy sweet accord. And, fortunately, gets better. But too little too late. Stays cloying for a long time. I got no tobacco/cigar/ash here but that maybe because my senses were still recovering and won't be trying again. The fruity-orangey opening is not bad, but on my skin it never develops satisfactorily; the fruitiness is a bit too generic, and the citrus a bit too stale, more like a peeled orange that was left on the plate and dried out over a day or two. Unlike many other scents - mostly created to woo the impulse customer with their opening blasts - this one actually improves with time. In the drydown a fairly sweet vanilla and jasmine develop, and they work together well. Further down the development track, there arrives a mild-mannered tobacco that is not very Cuban, more akin to a fresh Jamaican Macanudo still in its cedarwood box. The tobacco is smooth and again blends in beautifully with the vanilla, enhanced by hints of white musk. The performance is excellent with fairly strong sillage, excellent projection and ten hours of longevity - nothing to complain about in this department. In spite of the rather disappointing start, this eventually turns out to be a satisfactory olfactory voyage after all - just. 3/5. Is this what the communist capital of the Caribbean smelled like, pre-Fidel? Probably not even close, but TDHoH is a pretty nice gourmand tobacco, amber and sugary vanilla that may conjure what life may have been. This is a big, sweet fragrance that needs some restraint and a gentle touch to wear without causing a revolution. The tobacco and jasmine notes that appear in the heart are rich as a greedy capitalist pig. Just not much occasion for me to wear a fragrance like this, but if you spend your weekend mornings with a newspaper, espresso and cigar while lounging in a cabana, it's perfect. Neutral, but deserving of better. I crave this one sometimes! To my nose, it smells like a pitcher of sangria at the end of a party, when the fruit at the bottom of the pitcher is now room temp and has steeped in the rum for several hours. I get the vanilla too, and maybe a bit of tobacco in the background. Wouldn't/couldn't/shouldn't wear this to the office (too much! ), but this scent would be great at a summer party. Some winter nights I put this on before bed as a cozy scent. Good longevity and definitely different from most of the scents I have....Love it! There are no member images of The Dark Heart of Old Havana yet. Why not be the first?